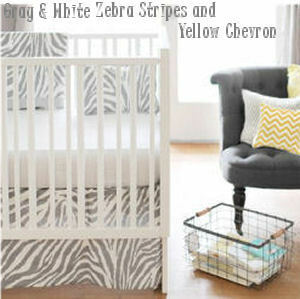 I spent naptime yesterday on gray and white zebra and chevron stripes baby nursery ideas. As much as I've enjoyed decorating the occasional black, white and hot pink zebra room for baby girls; this themed nursery needed an update. I felt that it needed a little jazzing up, a new accent color and a NEW look. I didn't think that this design board would start out with a set of baby bedding as inspiration but the gray and white color scheme of this collection changed my mind. 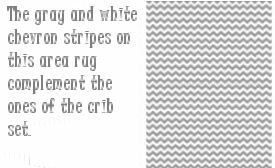 The gray and white stripes of the crib set have a softer (if less natural) appearance. 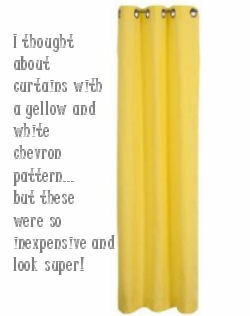 I initially looked for floor-length curtain panels that were made with fabric that had yellow and white chevron stripes but when I found these for less than $13 each; how could I pass them up when the yellow and white chevrons were more than double that price? I would just find another (less expensive) way to work in the pattern elsewhere in the room which brings us to the sitting area. 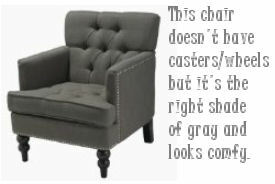 My primary concern when shopping for a gray armchair for this nursery was that I wanted one that was first, comfortable and second; I wanted one in the right shade of gray. Not only did the upholstery need to blend with the color of the crib linens but that of my favorite piece on the entire nursery inspiration board which I will reveal next. 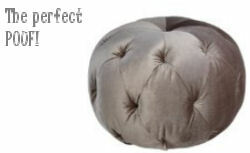 The perfect piece of the puzzle in my search for great and white zebra and chevron stripes baby nursery ideas is this elegant charcoal gray pouf, ottoman..whatever you call it; it's devine! There should be a spot in every nursery where mom and dad can sit and snuggle with their baby to their heart's content. Frankly, I was concerned that this design wasn't taking care of that need until I found a pretty place where they could put up their feet. But what about back support? 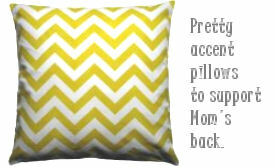 The combination of one throw pillow with yellow and white chevron stripes and another with gray and white stripes is a nice addition for decorative reasons as well as one that will offer lumbar support. In a small space, the stripes of this area rug might be too busy. However, in a large room it would be lovely in front of the baby's crib or in the seating area. Every family has its own favorite sayings and rules that they live by but I believe that to Love and Cherish, Forgive and Forget, Give Hugs and Kisses and Listen and Learn are excellent suggestions. 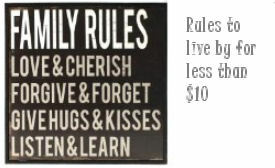 The fact that this wall sign is less than $10 just sweetens the deal! Now, I'm satisfied with this nursery design board. 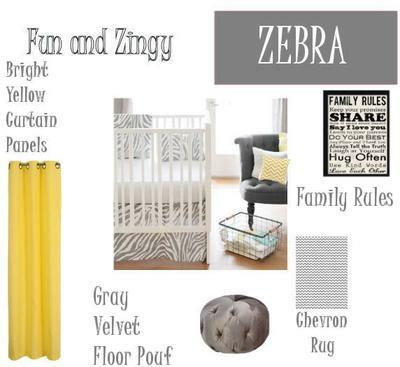 The modern white, yellow and gray nursery color scheme gives my favorite wild animal print a makeover that I think moms-to-be decorating a nursery for baby will love with inspirational and comfort features they will appreciate even more after their little one arrives. Feel free to leave a comment if there's something you would like to add or you can upload your own zebra decorating ideas that Unique Baby Gear Ideas' visitors can enjoy. Join in and write your own page! It's easy to do. How? Simply click here to return to ZEBRA NURSERY PICTURES.